My hubby's golden birthday was last week. He turned 25 on the 25th, thus I wanted to make this day special. Each person was invited with their very own golden ticket through facebook or via snail mail. The day of the party we had made a TON of food- salads, BBQ, fruit, chips, etc and golden lemonade (of course). Guests first played a game asking 25 things about "The Golden Boy." Winner (his mom) received a bag of Pepperidge Farm Goldfish. Eating commenced, followed by opening gifts. Finally, upon leaving, each guest was encouraged to take a golden box filled with individually wrapped golden rolos and a thank you note. Could I have said the word "golden" any more times?? :) We had such a good time and it will definitely be a party to remember! i love the theme + all of your ideas, so creative! 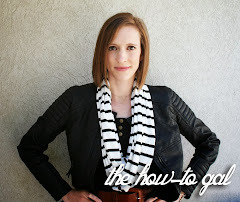 so you mean...i can't do this for my hubby's 26th birthday?! DANG IT! 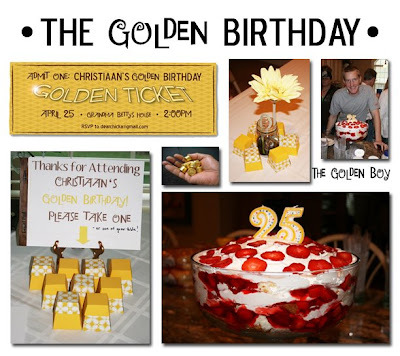 I missed the whole golden thing on his 25th... but how perfect for his bday to ON the 25th! Clever idea...just love it!